My favourite food is Hawaiian pizza. I enjoy how the sweet counters the spicy. DORA Construction is a dynamic commercial contractor based in Halifax and Sydney with proud roots in Atlantic Canada. We have delivered exceptional construction projects ranging from large commercial developments to meticulous restorations across Nova Scotia, including Cape Breton. Our expertise encompasses a broad spectrum of project types including new retail and industrial, historic restorations, and First Nations construction. We invite you to discover our passion for building and construction excellence, our dedicated people, and our wealth of experience that forms the solid foundation of DORA Construction. My favourite movie would be the Clint Eastwood western, For A Few Dollars More. I have the poster hanging in my office. We build engagement with our clients. We build partnerships with all the key players on every project. We build understanding of every stakeholder's role. We build on our guiding principles. We build with a long-term view. From our solid foundation, we will build yours. Depend on it. From large commercial projects to meticulous restorations our capabilities are both diverse and specialized. DORA Construction provide a unique service within the general construction industry. Have a look at some of our diverse projects and see why our clients trust DORA Construction to Build Solid. The new terminal replaces a 30-year old structure and includes several new amenities for commercial users and the travelling public. 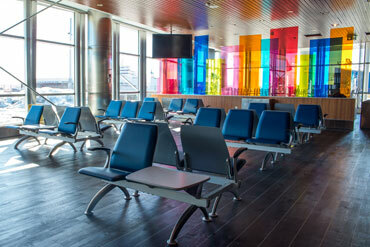 The new terminal opened in the 2015-16 fiscal year. The new building is modern, efficient, environmentally friendly and offer new amenities such as a commercial driver seating lounge area. Constructed of structural steel, Apolic panels, curtain wall system, masonry and both an HVAC and heat pump system, this project is striving for LEED certification.